Situated in the picturesque village of Musso, 15 km north of Menaggio. Musso has little traffic due to a by-pass tunnel. At 5' walk you are in the lively little city Dongo with shops, boat rental, lots of shops and restaurants. It is the place to be for relaxing, fishing, watersports, walking, biking and enjoying the magnificent views and Italian food and wine. Skiing you can do at Madesimo (45' drive) and the famous ST Moritz (1.15' drive). The magnificent Menaggio Golf club is at 15'. The new Estate Isola Bella, at the waterfront of lake Como, offers a shared pool with solarium, direct access to the lake and a garage. The apartment is at the ground floor, and has a private garden with furniture and offers a breathtaking view. It has a private boat mooring. Living with flat screen, satelite TV, playstation 2, DVD, kitchen, hall, bedroom 1 (double bed), bedroom 2 (3 beds) and bathroom. Washing machine, dryer, dish washer, fridge, freezer, oven, microwave are available. 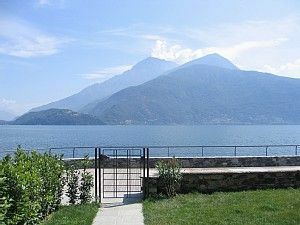 Menaggio Golf Club: The Menaggio and Cadenabbia Golf Club is situated on the western shores of lake Como (above Menaggio). It is a par 70 18 holes course. This course, from which has panoramic views of the lake, is the oldest and one of the most established golf courses in Italy. The Menaggio is a tricky course with narrow fairways and steep inclines. Ski : Madessimo and/or St. Moritz: Skiing you can do at Madesimo (45' drive) and the famous ST Moritz (1.15' drive). For Madesimo, you park your car at Campodolcino and take the Ski train which brings you in 3 minutes up to 1700m in Motta. Slopes are from 1550 m till 2880m. All kind of slopes are available and it is a very family minded ski area. The famous St.Moritz is a 1.15' drive. It offers 350 km slopes with a broad variety between 1738 - 3303 m.
Hello, We are Bart and Kristien and have acquired the newly build property in 2007. We try to go there at least 3 weeks per year with our 2 sons and daughter. As from 2012 finaly the private mooring was finished and has added value to us all in Isola Bella. Now you can easily park your (hired) boat or start windsturfing from there or just lay in the sun in the lake. We fell in love with the astonishing views on the lake and the mountains. It is a little paradise. We can look for hours to the lake, it has a relaxing effect and you feel immediate at home. Being at the south of the alpes and near the lake it has a very soft and sunny micro climate. It offers everything for having a pleasant holiday. In the first place the view, the lake and region Next to that the swiming pool and solarium, the conform in the appartment and the varity of possible activities. In summer it permits sailing, windsurfing, swiming in the lake (or the swimming pool). Especially in spring and late summer and early automs it is fantastic weather to make walks in the mountains behind the appartment. In winter we go skiing in Madesimo which is only a 45' drive. There is a private boat mooring in front of the appartment which can be rented separately. Had a great weeks holiday in Musso overlooking Lake Como. Apartment was well equipped and clean and the setting was amazing. We loved exploring the surrounding areas by boat and Milan by car. Pool was shared but never got too busy. we were very satisfied of our holiday in Musso. The appartment is very well equiped, there is everything you need . The photo's on the site give an exact image of the appartment. It is very cosy. Most of the appartmentowners are Italians from the region who come only in the weekend. They are gently and helpful. you have a great view on the eastside of the lake and the mountains nearby the italian alps of Madesimo and the swiss border. There is no traffic noise. The como lake has globally a nostalgic atmosphere; there are tourists but you have never the impression to be in a masstourism environment. Als gezin met 3 opgroeiende jongens hebben we best wel wat eisen, maar dit appartement heeft alles wat we wensten: zwembad, meer (heerlijk vanaf de steiger duiken), goede bedden, PS3 waar je Netflix op kan kijken, een keuken met alles er op en er aan en een zeer ruim terras met voldoende privacy. Ook binnen heb je voldoende ruimte. Een dikke 10 voor deze locatie! Für einen Familienurlaub hervorragend geeignet. Wir kommen gerne wieder. A very nice little apartment on the ground floor, which opens to a small garden and a shared pool with sun loungers. Meters from the apartment (difficult with small children) and we had to pick up and drop off the keys ourselves (there were no personal contact with the managers of the property). Sehr schöne Wohnung in traumhafter Lage! Trotz (kleiner) Ferienanlage sehr ruhig und beschaulich. Der kleine Ort Musso ist wenig touristisch, es gibt aber alles was man braucht. Sehr nette Vermieter und gute Kommunikation. Lake Como in Lombardy, Italy has an area of 146 km² is the third largest lake in Italy, and a very fine climate with excellent sailing winds. From Musso/Dongo you can take the boat, which is the fastest and nicest way, to Como. Como is a very nice and old city with a magnificent Cathedral. You can stop in Bellagio, Menagio or other magnificent places. The city of Lugano in Switzerland is at 45' and an absolute must is Milano (1.15h) with the exclusive fashion and furniture shops, the Duomo, the San Siro football stadium and the nice old city. If you like the mountains or ski in winter Madesimo (45') offers nice ski slopes (1500 - 2900m.) or summer mountain walks and if you prefer the top you can go to the famous St. Moritz (1.15'). You can rent a boat (up to 40 pk without a licence), follow sail, water-ski of surfing lessons (Dongo & Domaso) or fish (fishing materials in Dongo and Menaggio). You can rent a mountain bike and do one of the many mountain bike tours around the lake. Golf: A very nice Golf Court is available in Menaggio. Ski: Skiing possible in Madessimo (45' drive) park your car in Campodolcino (1070m) and take the train elevator that brings you in 2 minutes to 1700m. The elevator is included in your ski pass. Other ski areas are nearby as the famous St. Moritz in Switzerland. Except July and August more flexible agreements on start date and end date of the week are available as long if it is not a sunday as our cleaning lady does not work on sunday. For cleaning, linnen and towels a cost is charged per stay. All other costs (electricity, water, housekeeping) are included. If you want to use the private mooring (boat dock) for your boat a cost of EUR 100/week is charged separetely. You have to indicate you want to use the mooring for your boat.